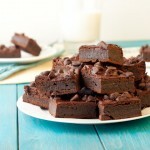 Allergen-free brownies fudge brownies. They’ll melt in your mouth! Preheat oven to 350F and prepare an 8×8 baking dish with coconut oil. Ensure all nooks and crannies are well oiled. The mixture naturally has oil, so I didn’t bother using parchment. In a food processor , combine bananas, sunflower butter and chia seed mix. Process until smooth. 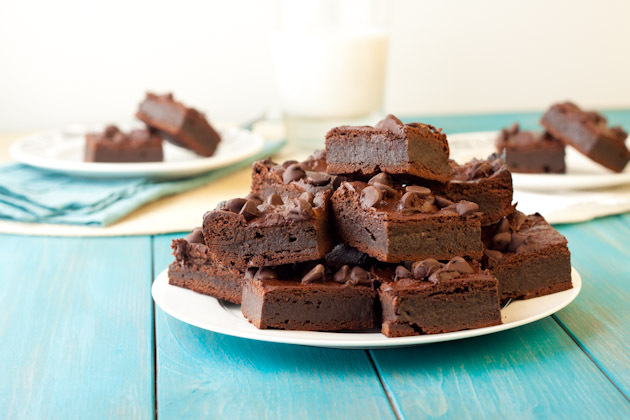 Transfer batter into a well greased 8×8 inch Pyrex baking dish and sprinkle with chocolate chips. Bake for 30-35 minutes, until a toothpick comes out clean and the sides begin to get golden. Remove from the oven and allow to sit for 5 minutes. Cut in the pan into 16 squares and have at ‘er! If vegan, do not sweeten with honey. If grain-free, do not sweeten with brown rice syrup. I tried a batch without the stevia and they weren’t sweet enough. If you don’t want to use stevia, sub the plain roasted sunflower seed butter with the sweetened version and you should be good!